It is important to understand your body type in order to plan your diet program and muscle building training. This is because a person’s body type influences how he/she responds to training and diet. When the muscle-building bug first bit me, I was overwhelmed by the number of different diets, supplements, training programs, information, and articles there was out there. With so many conflicting training programs and diets available, I did not know where to begin or what to do. This resulted in about six months of working out with little gains and even less motivation to continue training. To make the situation even worse, there were guys in the gym who seemed to do very little to achieve the type of physique I could only dream of. I was at a complete loss. In fact, I almost gave up. Fortunately, I met a guy in the gym who told me about body types and how they affect diet and training. That information opened my eyes to the reasons why I was making little gains in the gym. Essentially, these are fancy ways of saying naturally muscular, naturally bug, and naturally lean. If you want to see significant changes in your physique, you need to exercise in a way that compliments your body shape. You should pay less attention to your strengths and concentrate on your natural weaknesses. The notion that body types are genetically predetermined is nothing new. In fact, both Plato and Friedrich Nietzsche referred to the concept before William Sheldon made the three main categories of body popular in the 40s. Body type describes more than how a person looks. It also gives information about a person’s sympathetic and hormonal nervous system characteristics and how he responds to food intake. If you want to plan your diet and training regimen successfully, you will need to understand your body type. Once you do, you will be able to adjust your nutrient intake to maximize your health–related and fitness goals. If you want a good example of a mesomorph, think about your high school football stars who seemed to pack on more muscle while also maintaining their lean physique just by looking at weights. 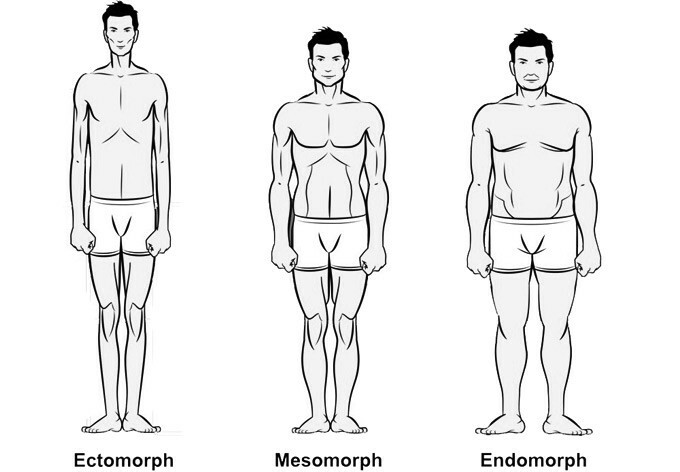 The mesomorph body type is, somewhat, in between the endomorph and ectomorph body types. In a sense, it displays qualities from both body types. A mesomorph has a larger bone structure and larger muscles, but a low body fat percentage. I bet this is the type of body you would want. If you are a mesomorph, however, you will know it from the envious looks you get. Mesomorphs find it quite easy to lose and gain weight, and they are naturally strong, which is the best foundation for building muscle. They also tend to be growth hormone and testosterone dominant. Most mesomorphs seem to take their bodies for granted, which can lead to poor diets and diluted workouts. However, since they gain fat more easily than ectomorphs, they need to watch their calorie intake more closely. Some of the famous mesomorphs include Arnold Schwarzenegger, Mark Wahlberg, Sylvester Stallone, Jennifer Garner, Anna Kournikova, and Halle Berry. If you are a mesomorph, you need to train in the 8 to 12 rep range and rest for a half a minute between sets. You also need to do enough cardio to maintain your lean physique. When it comes to your diet, you need to portion your meals by balling up your fist, which represents one portion size. Remember to eat enough calories to maintain muscle mass and keep your carbohydrates intake at 40% to 60%. Finally, break your meals into five or six smaller meals throughout the day. This body type is the complete opposite of an ectomorph. Endomorphs are usually large with little muscle definition and heavier fat deposits. They usually find it extremely difficult to lose weight even when they try different workout and diet programs. They gain fat easily and are usually of a shorter build with thick legs and arms. Their muscles, however, are naturally strong, especially their upper leg muscles, which means that they excel in exercises such as squats. Most power lifters and football linemen tend to be endomorphs. People with this body type also tend to be insulin dominant, which means that they have a greater propensity for storing energy, including both fat mass and lean mass. If you are an endomorph, you may think that you are destined to be overweight. However, this is not so. You just need to make an effort to eat the right food and make exercise a part of your daily routine. Examples of famous endomorphs include John Goodman, Jack Black, Luther Vandros, Beyonce Knowles, Jennifer Hudson, and Queen Latifah. Endomorphs need to do as much cardio exercises as possible and train in the 15–plus repetition range. They should also do compound lifts to burn calories and take 30 to 45–second rest periods between sets. When it comes to the diet, endomorphs should eat 30% to 40% carbohydrates and portion their meals appropriately. They should include whole grains and non–processed foods in their diet and eat large quantities of veggies to keep them full. They should divide their caloric intake by five to six meals and drink plenty of water. Finally, they should avoid flash diets. You can easily spot this body type in any weight room. Ectomorphs are usually below the average weight for their height and often appear skinny. They tend to have unusually high metabolisms and often suffer from fussy eating with little or no weight gain. Examples of famous ectomorphs include Brad Pitt, Chris Rock, Bruce Lee, Kate Moss, and Cameron Diaz. An ectomorph should do compound lifts and train heavier in the 5-10 repetition range. Due to the heavier weights used, they should take longer rest breaks and avoid doing cardio. Ectomorphs should eat high–density weight gainers and break their caloric intake into several small meals. They should eat foods such as avocado, almonds, and peanut butter, and eat at least 50% to 60% carbohydrates. They should also drink tons of milk and eat foods they enjoy. Click here for more training tips for the skinny Ectomorph. Few people, however, fall perfectly into one of the above categories. You might have some qualities of the three body types. Pure breeds are rare. I hope that this information will help you succeed in your health and fitness goals. Please share this post if you found it useful.